HOME > ［News & Events］ Mr.ZHU Zhi, Human Life Design Area, received the Student Presentation Award in ASJ Spring Meeting 2018. Mr.ZHU Zhi, Human Life Design Area, received the Student Presentation Award in ASJ Spring Meeting 2018. Mr.ZHU Zhi, (3rd year doctral student in Unoki Lab of Human Life Design Area), received the Student Presentation Award（ASJ Autumn Meeting）in ASJ Spring Meeting 2018. Since establishment of the Acoustical Society of Japan in 1936, a large number of researchers and engineers from all fields related to "acoustics" have participated in the society, and the current number of members is about 4,300. 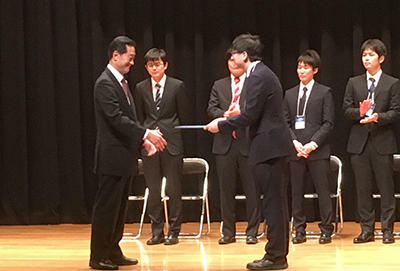 At the academic conference held in the spring and autumn, to the student who was recognized as having made an excellent paper presentation, Student Presentation Award is presented during the next research conference. Study on the contribution of modulation frequency bands on the speaker individuality perception of noise-vocoded speech. This study aims to clarify the contribution of modulation frequency bands on the perception of speaker individuality using noise-vocoded speech.The previous studies about speaker individuality usually focused on the features based on speech production.On the contrary, this study focused on the features based on human auditory system. A speaker distinction experiment using noise-vocoded speech was carried out to investigate the relationship between modulation frequency bands and the perception of speaker individuality.The results suggested that the modulation frequency bands beyond 4 ~ 8 Hz should contribute to the perception of speaker individuality.The results of this study can deepen our understanding about the mechanism of human speech perception and also can contribute the development of cochlear implant and speaker recognition system. It is my honor to receive the best student presentation award in ASJ Autumn Meeting 2017. I would like to acknowledge Prof. Masashi Unoki, the previous JAIST Assistant Professor Dr. Ryota Miyauchi, Prof. Yukiko Araki from Kanazawa University, for their invaluable suggestions and comments in this research.I would also like to acknowledge Prof. Tatsuya Kitamura from Konan University, who provided the important data of speaker similarity.I would also like to express my sincere thanks to the experiment participant. 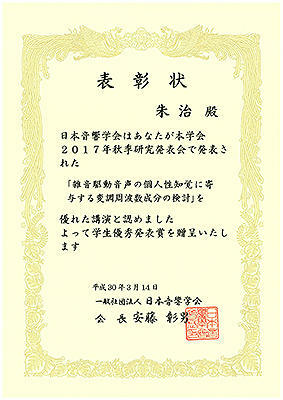 This award motivates me to study further.